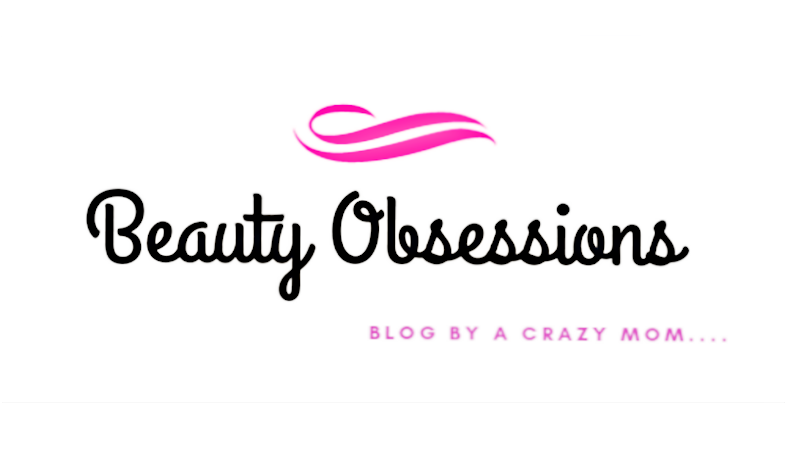 Subscription boxes are all around these days and I personally love the concept of subscription boxes... Each month you will get surprises in terms of beauty, skincare, makeup products and jewellery in less than half of the total price.. 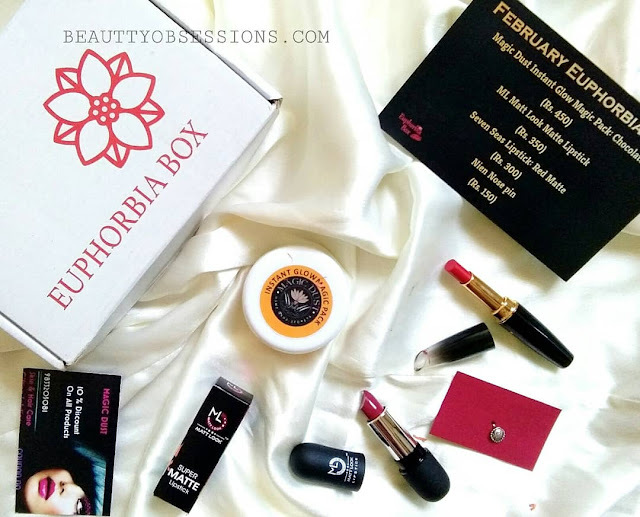 There are so many beauty subscription boxes in market but the one which took my heart away is Euphorbia Box. 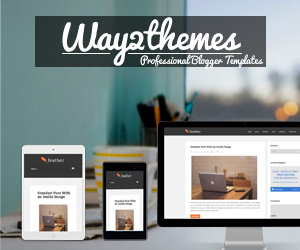 It is the most affordable subscription box till date.. 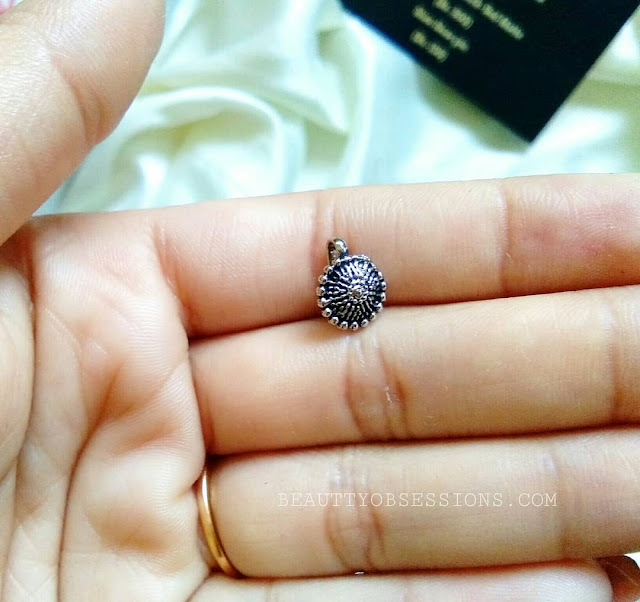 There are skincare products, makeup products and jewelry in one box and the price is only Rs248/- ... Isn't it cool ? So, recently I received the February edition of Euphorbia Box and love the revised packaging of it. It is looking more prettier and organized.. There are four products and all are full size products.. In the February box, you will get two full size lipsticks, one full size chocolate face pack ,one nose pin.. All the products costs Rs1250/- in total but you are getting these only for Rs248/- .. I find it as a great deal to grab. 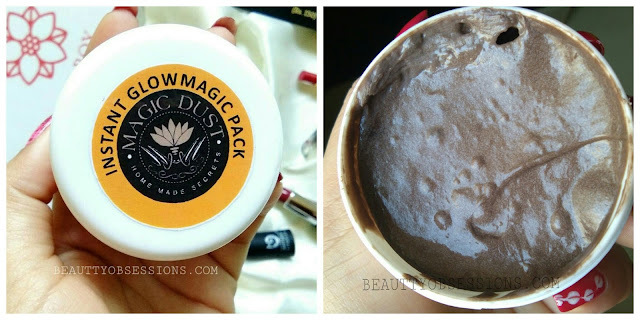 Let's see the products closely..
1- Magic Dust Instant Glow Magic Pack (Chocolate) - I am very excited to try out this chocolate face pack .. Though the brand is new for me but the ingredient list is so tempting. It has chocolate ,cocoa butter, shea butter, jojoba oil, argan oil, vit E oil. I haven't tried it yet but i will share my view in some other post. 2- ML Matte Look Matte Lipstick - This is a very pretty pink-ish red shade ..The texture is creamy and it settle into matte finish. Everyone will get the same shade in their box . I like the cute packaging . 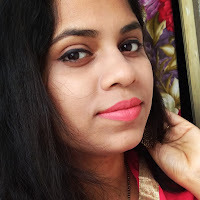 3- Seven Seas Lipstick - Red Matte - It is again a very pretty red shade with warm undertone . 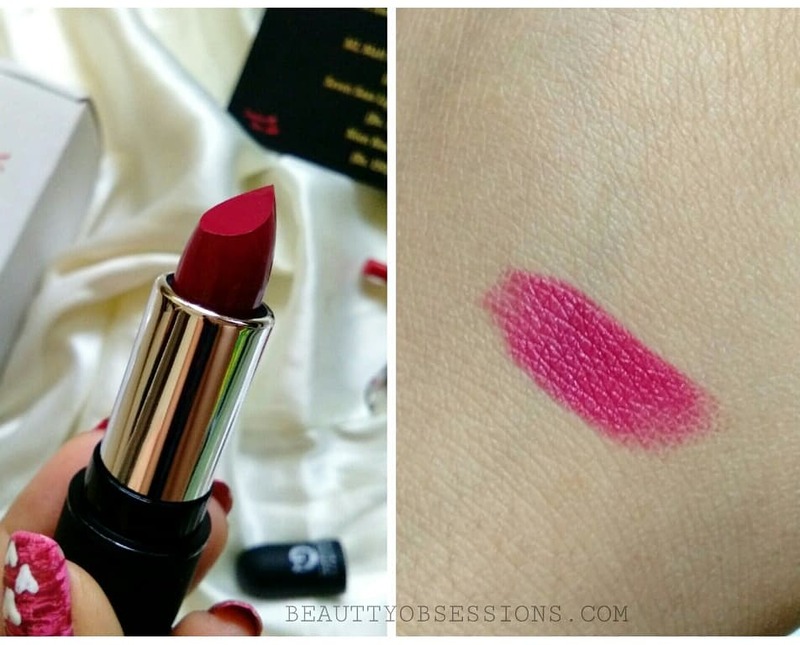 It is a complete matte finish lipstick . 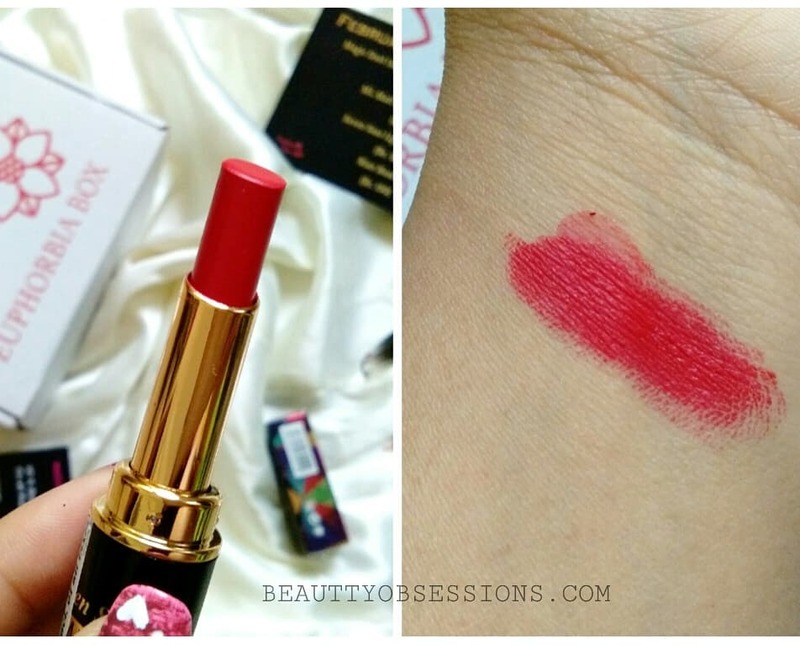 The packaging is great .The texture is also perfect to apply on lips. I love such warm red shades. 4- Nien Nose Pin - This is a beautiful German silver flower nose pin.. 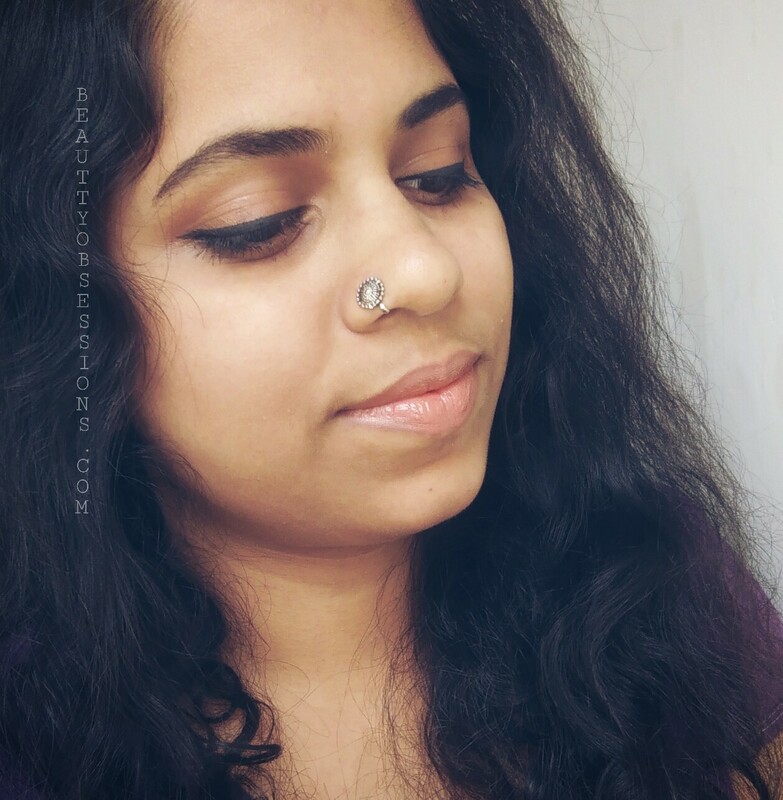 I have never tried such nose pins earlier but i am loving this a lot.. So these are all the products you are getting in February Euphorbia Box . I think this box is perfect for gifting purpose as well. Hence don't waste your time and book the February edition Euphorbia Box right away. See you in the next post ,till then keep visiting. This is one such box which is never heavy on pockets. I am not very sure about the ML lipstick else looks nice and good. Wow, You look damn pretty with that nose pin on. Euphorbia Box is my favorite too.